Cox’s Bazar – Some 30,000 Rohingya refugees living in Cox’s Bazar will soon have easier access to safe water with the inauguration of a major new borehole project this week. It is the first part of a high capacity water production and supply system designed to meet spiraling water needs in Ukhiya sub district, which suffers frequent water shortages. Last year’s massive Rohingya refugee influx into Ukhiya and Teknaf sub districts placed huge pressure on water supply in Cox’s Bazar. Both the refugees and host communities have been suffering from insufficient supplies of safe water. 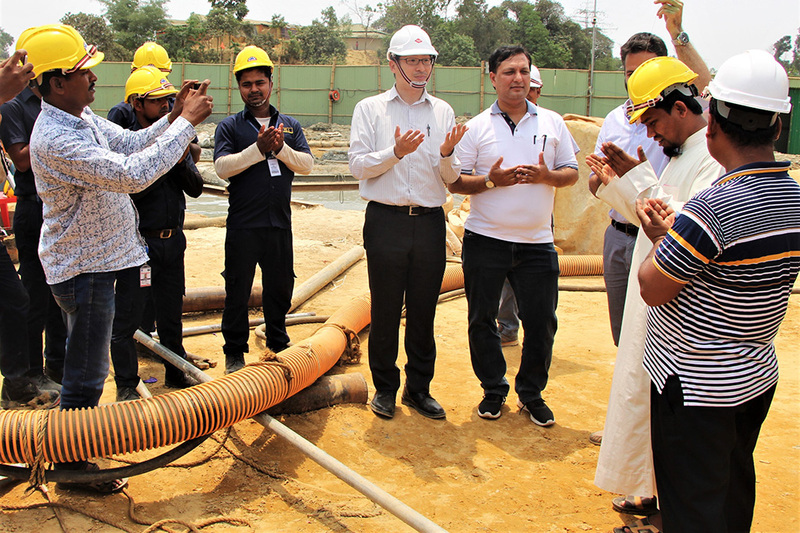 To address the need, IOM, the UN Migration Agency, launched the safe water supply project in collaboration with the Japan International Cooperation Agency (JICA) and Bangladesh’s Department of Public Health Engineering (DPHE). At present, the targeted population need about 500 cubic meters of safe water per day. The test / production well that DPHE will establish with JICA backing expects to be able to meet that demand when it is operating at full capacity. IOM will design and construct the water supply network and facilities once the borehole work is completed next month. It expects to start the water distribution within three months of the installation of the borehole. “The camp is very congested. Almost 95 per cent of toilets are close to water points, and these eventually degrade the water quality. So, the Government decided to go for establishing deep tube wells. We thought that there might be problem with deep tube wells as well in future. So, we decided to go deeper and establish this deep ground water production well,” said Naoki Matsumura, JICA’s country program coordinator for disaster management. “This boring machine can drill down to 400 meters, which is very useful if we need to dig deeper than the existing deep tube wells in the camps. A lot of water can be lifted through the thick pipe of the borehole, tested and treated to ensure the quality, before being distributed to a very large number of people,” he added. There are currently hand pumps in the areas near where the borehole is being established, but many have now run dry. “We have one near our shelter. But the water flow is declining all the time,” said Saibun, 23, who lives with her 5-member family nearby the borehole site in camp 12 of Ukhiya. “There is another pump, but it also ran out of water. Now people come to fetch water from this pump,” she added. “Access to safe water is a human right. This investigatory project poses several challenges. First is getting good quality ground water. This is just the initial step to see how successful the project will be,” said Md. Saifur Rahman, DPHE’s Superintending Engineer, Groundwater Circle. As part of the water supply network, some 20 water points will be set up within the targeted area of the camp. Each water point will have 4 – 6 taps to serve 250 people per tap per day without queuing up for more than half an hour. The maximum distance from any household to the nearest water point will be 500 meters to ensure that the targeted population can easily access it during the distribution hours, which will be twice a day, three hours each time. “It’s very difficult to ensure safe ground water here. But we’re very excited about this project, which is the first of its kind in the camp. It will ensure daily access to safe water for 30,000 – 40,000 people,” said IOM Cox’s Bazar Emergency Coordinator Manuel Pereira. “If it’s a success, we will scale it up in other areas of the camp, as well as in host communities, especially in Teknaf where groundwater is scarce,” he added.